How are you guys doing? I do not feel well today actually, (I think I may be having a cold..)I am a little sick but unfortunately, I had A LOT of errands to do :( I think it is because of the weather. It is acting up like crazyyyyy! 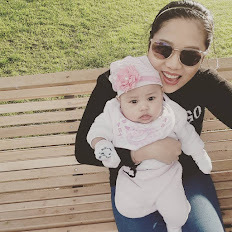 One day its raining then its super sunny... I mean hello?? makeup your mind! Anyway, I am gonna be reviewing these new babies that I got a couple of weeks ago and I am sure that most of you have heard or seen them already. There babies are created by no other than Sam from Pixiwoo, one of the most popular makeup gurus in Youtube. 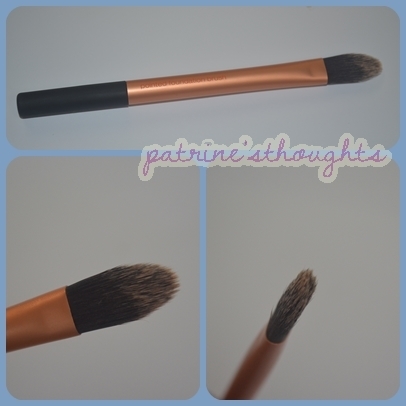 I have seen them use these brushes and I just cannot help but get my hands on them too! It comes in a clear plastic box with labels at the back to so that you can see each names and uses of each brush. 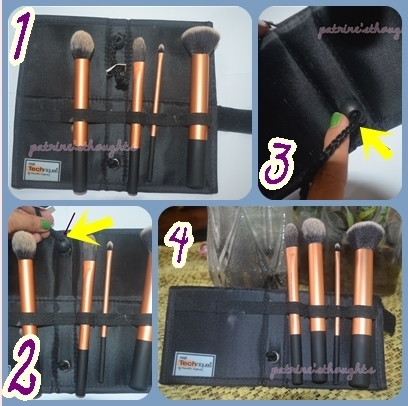 Once you open the box, you will see a black brush holder that can be used both ways. According to the Real Techniques Website, the bristle of the brushes are made of Taklon which are synthetic fibers that are smoother and finer compared to the fibers of other brushes. And since they are synthetic, they are also 100% cruelty free. Now let us go to the detailed pictures of the brushes shall we? 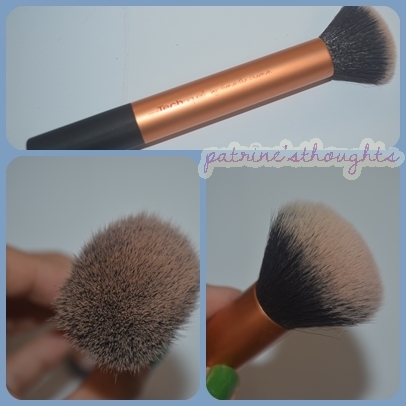 I use this brush to set my foundation with setting powder or apply my powder foundation. To be honest, I expected it to be softer but it wasn't as soft as I expected it. It does the job well though. I also use this for my blush and I love how it can diffuse my blush when I apply too much. 2. Pointed Foundation Brush. Use with liquid foundation to build custom coverage. This is my favorite in the set! I just love how it can blend and spread creamy foundation such as my Revlon whipped Cream makeup. I don't have to use my fingers anymore and it gives a really nice flawless finish. 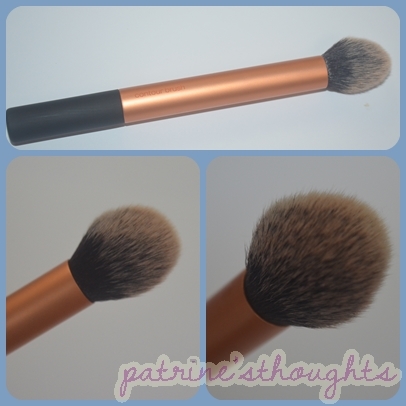 Unlike other similar foundation brushes that I have tried, it does NOT streak at all! My only problem is that it is too small. I really expected it to be a little bigger but it takes a while for me to finish blending my foundation on my face and neck . 3. Detailer Brush. Precision cut to effortlessly conceal problem areas or use with lipstick for long-lasting shape and definition. 4. Contour Brush. Delicately applies highlighter to contour or create sheer, soft-focus finish. I like the shape and texture of this brush. It does not pick up much of the product so it makes it easier to control and apply bronzers and contour powders because you get to build up the color rather than start with a LOT of color and end up looking too bronzed/contoured. Same goes with applying powder highlighters, it deposits just the right amount of the highlight and you can just add more if you want. Only downside, is that some bronzers are not so pigmented so it takes time to build up the color. The way the brush "feathers" out at the end makes it easier to blend the edges bronzer/contour powder for a more natural look. The handles of this brush set is colored black with gold to signify that it is used to create a flawless base for your other makeup. They have a color-code fro each brush set, purple for enhanced eyes and pink for the perfect finish brush set. All in all, these brushes are good investments. Whether you are starting with makeup or a professional makeup artist, it is important to have the right tools in order want to achieve a flawless base for your makeup. If you are on a tight budget, then I suggest you start saving up because these babies are so worth it! So, have you tried these brushes? What do you think of them? 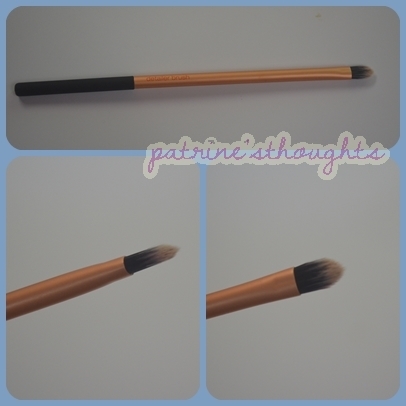 Have you tried other Real techniques brushes? Please do share your comments down below! I hope you learned something from this post. hi Mia. Thanks for sharing. I've been thinking of updating my makeup brushes and it seems like you read my mind. Thanks girl! have a fantastic day! glad you liked it and thank you for dropping by! they are really worth a try..hahahah..
Lovely post on these famous brushes :) I´ve been on a look-out for new brushes and these look like they do the job well, plus they are so affordable!